Real Estate Agents: Touchdown at Saluda River Club! On Thursday, October 23, Saluda River Club is inviting all residential real estate professionals in the Midlands for its Annual Agent Tour of Homes. From 11AM – 1 PM, agents are invited to “Score Big” and tour a collection of the newest homes in the award-winning luxury residential community with its three distinct neighborhoods: the Woodlands District, the Village District and the River District. Maps of all open houses may be picked up at the Saluda River Club Information Center on the day of the event, and the Annual Agent Tour of Homes will end at one of Saluda River Club’s fabulous clubhouses. To get in the winning spirit, everybody is encouraged to wear his or her college colors. To add to the festive game day atmosphere, there will be tasty bites and cold beverages available on the Agent Tour of Homes, and all participants will leave with a special gift. 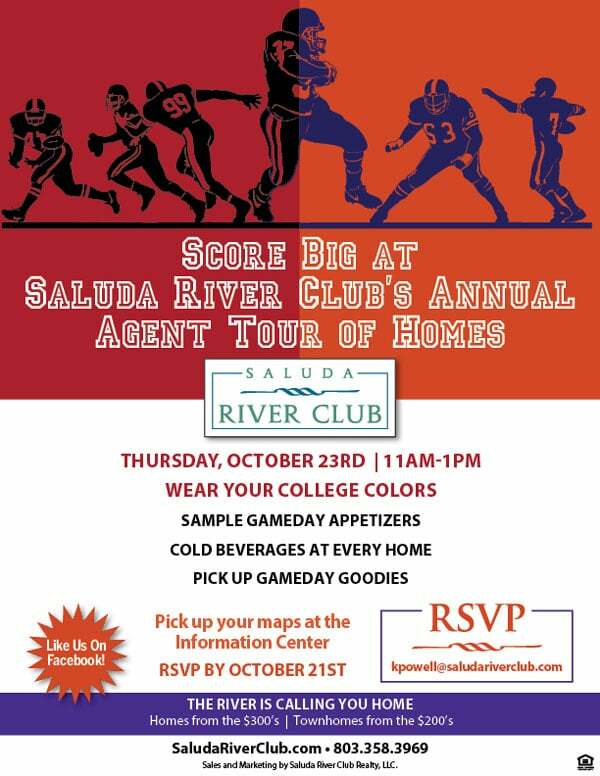 If you are a real estate professional and would like to attend Saluda River Club’s Annual Agent Tour of Homes, please RSVP no later than October 21 to kpowell@saludariverclub.com. To learn more about the various events hosted at Saluda River Club, and about the beautiful homes that may just be perfect for your family, please schedule a private tour soon. For more information or directions, please call 803-358-3969 or visit www.saludariverclub.com.